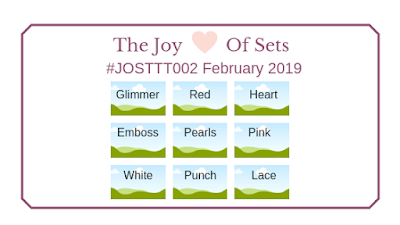 Welcome to another Joy of Sets Tic Tac Toe Challenge. Here is our grid for this month chosen by Andrea. I chose to use the white, pearls and heart line. 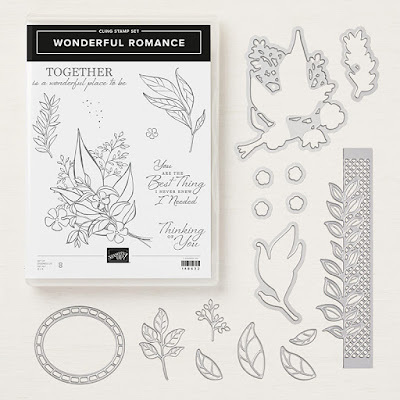 I've had a stamp set called Wonderful Romance on my shelf for a while now and not had the chance to use it so, this seemed the perfect opportunity. I was delighted to see the 'white' element on the grid - I do love white on white cards! So, with this in mind I decided to use a simple colour palette. The 'white' was my card base and another layer adhered with Dimensionals that was 5mm smaller. For the 'heart' element I used a die from Sunshine Wishes. The intricate open design was perfect for what I had in mind. To add some colour behind the heart I used an Aqua Painter and squeezed some Petal Pink ink into the lid to use as a palette. I smooshed it across the front taking care not to over wet the card stock. I cut out lots of different leaves and flowers using the coordinating thinlits. I then arranged them around the heart; this part always takes me ages! I am not a fan of adding flat elements to my projects so I added some dimension to the tiny flowers. 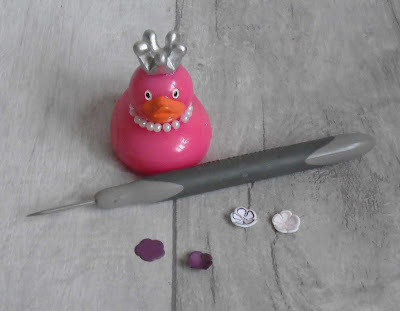 Place the flower in the palm of your hand and 'poke' with the end of the handle on the paper piercing tool. These tiny flowers curl up beautifully. I adhered the leaves with a tiny bit of Tombow on the ends of the stems, tucking then under other elements where I could. The pearls in the centre of these tiny flowers look so pretty don't you think? 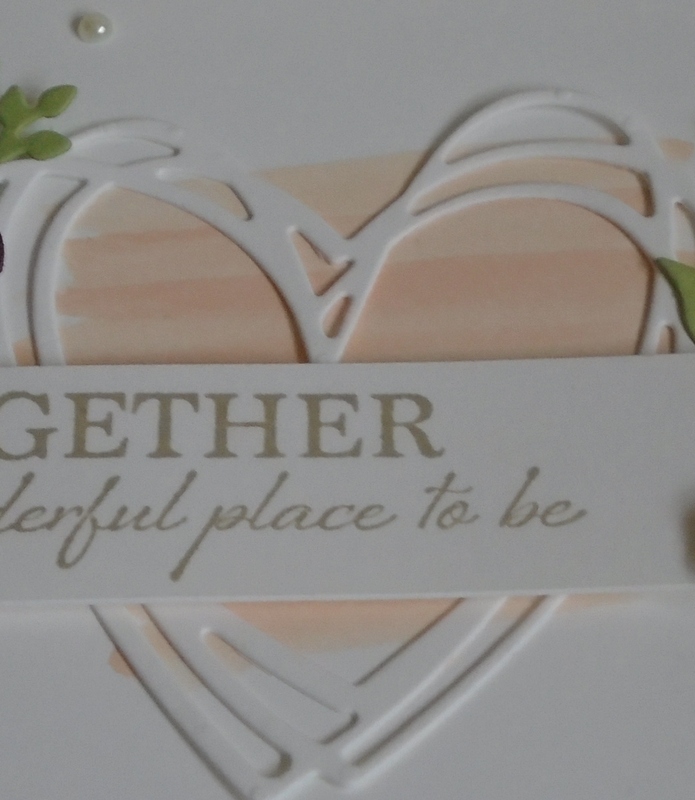 I stamped this lovely sentiment in Sahara Sand and adhered across the card front with Dimensionals. 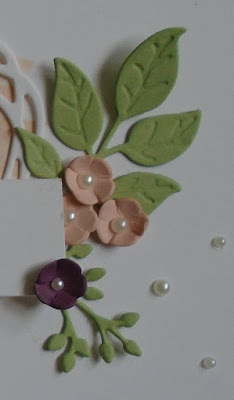 I also added some die cut pieces to the envelope (and more pearls). Not something I would do if the card was going to be at the mercy of the Post Office but I have recipients in mind for this card and it will be hand delivered. The 'pearls' element provided the perfect finishing touch - I might have got a bit carried away scattering them around! 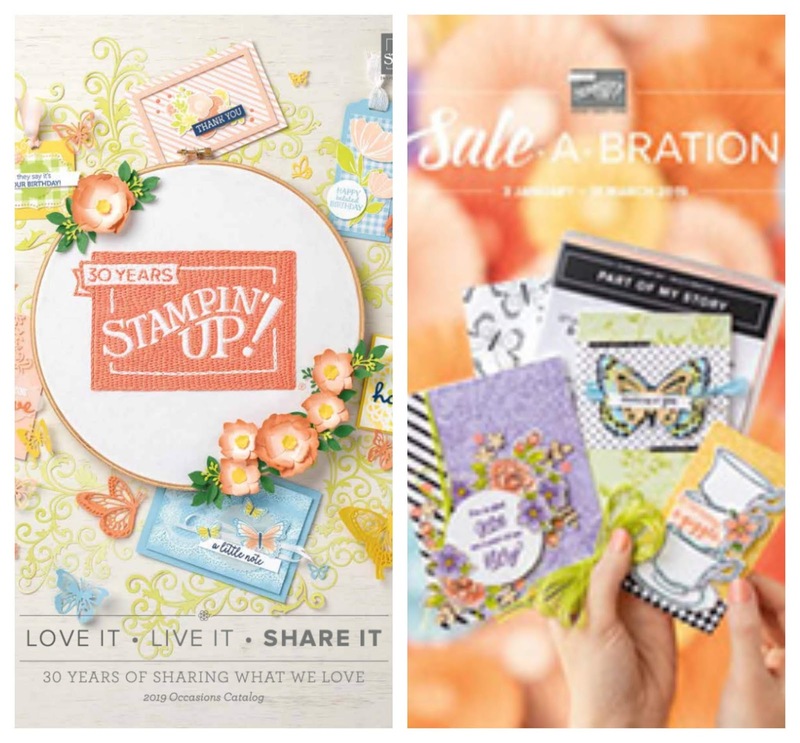 The Wonderful Romance stamps and Wonderful Floral Framelits are available as a bundle = 10% saving. If you purchase them between now and the end of March you will also be able to choose a free Sale-A-Bration item too! Thanks to Andrea for organising us with this great challenge - I really enjoyed this grid! We will be back next month with another Tic Tac Toe Challenge for you. 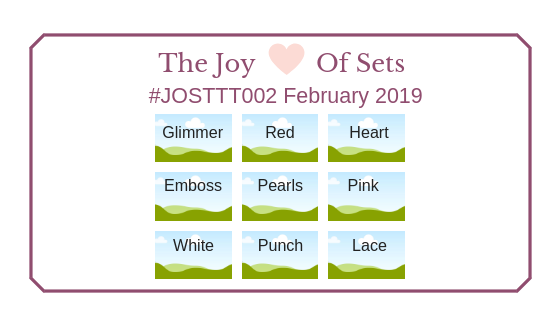 Head over the the Joy of Sets Blog to see what the rest of the Design Team have made of this fun challenge HERE. 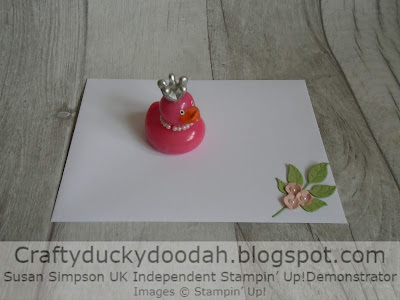 If you haven't tried a Tic Tac Toe challenge before why not give it a go; if you are stuck in a rut or suffering from crafter's block you might just find it useful! Beautiful Susan. I love the detail you go into with your blog posts about how you constructed your card. Thank you for the tip on how to make the flowers curl! Yours really added flair to your already pretty card! Love, love. 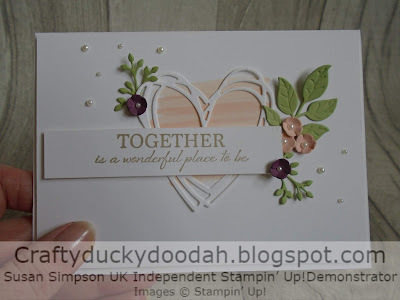 love everything about this card, especially the pearl centered flowers, Susan! Can’t wait to see what else you might come up with for this wonderful bundle.